Gracie and Morgan eating high on a back counter during our 5 star rating days. We are all adjusting to changes here with some surprises (for the human). Some have asked me how the cats are doing with the loss of their friend. I don’t know. They are cats. Only Morgan shows outward changes in behavior and has become needy. She was the closest to Hazel. Gracie is all about Gracie (as always) and Mollie hadn’t been spending time with Hazel in the past few years. I’m reporting what I’ve noticed. Morgan practicing her dining room skills last Easter. Notice how the centerpiece turned into a cat toy. Some of the plastic eggs were on the floor. Wonder how that happened? 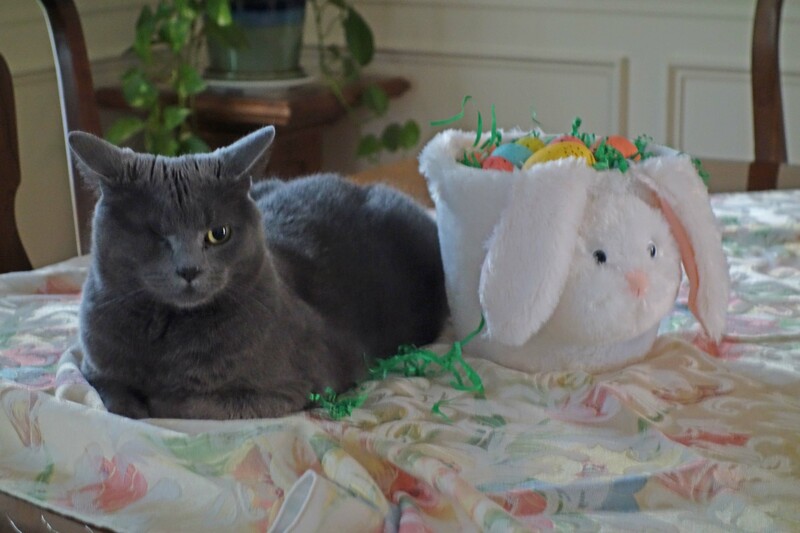 This entry was posted in Cat Adoption, Humor, Sassy cats and tagged cats, Gracie, Hazel, Mollie, Morgan, mourning pet loss, pet adjustments after death, pets by Kate Crimmins. Bookmark the permalink. Hi this is very interesting. I am always so glad there are other people in the world that love cats as much as I do. I am one of a few people at the place I work that love cats. I lost a Ginger cat I had for ten years. The younger Siamese cat that were left behind was treated badly. The Ginger cat was jealious because she was all ready twelve years old and never had another cat in the same house. Despite that the Siamese also showed that she missed the Ginger cat that tried to slap her every day since she was small. She climbed on my car’s roof if the window is open and looked inside. The Ginger got hit in the yard by a car. (Not mine.) I took the cat to the vet ,but she died. I brought her home in a plastic bag and did not show the Siamese the cat. Now it seems she wonder what had I done with the other cat. She looked in the car thinking the cat must be there somewhere. I had seen that she had really missed her very strange friend. It looked in way that she also went through grief. She really searched for the other cat. Your realm’s adjustments – not really so sad, but lovingly – written so well. I love the cat tree picture and the cuddling with bunny. How funny about the food and eating locations…bet they lobby for more fancy restaurants shortly. Oddly when Molly goes to run in the field with friends, now RC Cat gets really annoyed/worried and is extremely clingy and needy until Molly shows up again in a couple of hours. Fairly new behavior – we suspect/know the 2 of them hang out together when we aren’t looking and “chase’ in exercise mode rather than seriously…friends (but we are not supposed to know) Friendship crosses the oddest barriers? Morgan and Gracie are sorta friends. They play together and eat together but don’t sleep together. Each of them would sleep near Hazel but not each other. Takes a while for things to settle. What! No last will and testament? How just like Hazel. Always to the beat of a different drum. Nonconformist, they’re always loved—and that sounds like it’s pretty obvious in your home now. There was no whining, no complaints. She took a fast taxi to the rainbow bridge. Years ago after one of our dogs died, it took the longest time before I stopped finding little treats all over the place. She’d apparently been hiding them! I cried every time I found one. People who don’t share their lives with animals don’t necessarily understand how hard it is when they leave us! I have an untested theory that when one member of the animal family is gone the others do eventually take on a few new habits. Just changing an eating area or removing the “right” to sit on the dining room table puts new potentials into the mix. I think the adjustments for them, as well as you and the Beloved Husband, will be on-going for some time to come. She was loved! Everything does change. Gracie seems to be less affected but Morgan’s behavior is much more needy. She likes to be close to either me or another cat. That’s new. It is going to be an adjustment for everyone – humans and cats alike. They will settle into it. It will take a long time, but you will too. Hugs! We’re hanging in! Not much else we can do! True. It will get better! I’m so sorry for your loss, Kate. I think you’ve done a wonderful job of being as balanced as you can in describing the changes. Praying that you, and the others, make the changes you are going through with the smallest amount of sadness possible. Remember the good times. It’s a sad time but Hazel gave us good times and a few giggles over the years. Sending you lots of hugs during this time of change and finding the new normal. Not all the changes are bad but some are sadder than others. I think your remaining three kitties still sense what was Hazel’s and won’t gravitate to what was her “spots” – they don’t realize the harshness of the finality like you and your husband do. At least they have each other for now. After my friend Carol lost HJ in November, just one of the two remaining cats was a little lost … she roamed from room to room looking for HJ and would glance at a tearful Carol for reassurance that HJ was there and just nowhere to be found for now. The weirdest thing was that Morgan moved into Mollie’s bed. Mollie is older so a few years back I had added extra foam and fleece. Mollie always slept in it until Morgan got there first. The bed is upstairs and Morgan always was downstairs to that’s the biggest shift going on now. Mollie is sleeping on the pillow on the guest bed so it’s just as soft. You never know what they are thinking. No you don’t, and I had to laugh at a story that Carol wrote on Facebook recently. She lives in rural New York and her husband lives in Raleigh, North Carolina. David is an engineer and had worked for GM for years,. They were transferred to Shanghai for a few years, then transferred back to the U.S. where they settled in NY since he worked nearby. Then David got laid off permanently with a slew of other engineers and white collar workers. So he works in NC now and he is in his late 60s, so they don’t want to move there permanently. David only comes home when the plant shuts down, at 4th of July for 2 weeks and for Christmas/New Year’s. When he was home a few weeks ago, one of Carol’s cats does not sleep in his bed or cat stand – he sleeps with Carol, but during the day he stays in David’s favorite chair. So, since David is gone more than he’s there, David’s chair is where Dudley spends most of his days. He is an older cat, close to 14 I believe. When David is home and wants to sit in his chair, Dudley pouts and as soon as David gets up to go in another room, Dudley seizes that chance to jump in the chair … he hisses if David tries to sit in his own chair. 🙂 Carol said he is very territorial about this chair … it isn’t as if David is just a guest, he lived there in the house until he moved down to NC! At night, the same thing happens with the cats and David. This is not a big issue since David uses a CPAP machine so always slept in another bedroom before anyway … Dudley and Smudge likely would have an issue about that as well. They like what they like! Gosh, that must be hard for your friends living apart so much of the time. Yes, some of the stories she writes about her cats … but especially when Dudley and Smudge treat David like an intruder when he is back in town. Unfortunately, her cat who passed away in November, really liked David and would not leave his side (or lap) the entire time he was home. It is hard being apart, and he calls every night at 9:00 and they e-mail as well. She bakes and sends it to him all the time. GM moved them back from Shanghai to NY and they live in a tiny village of Honeoye Falls. It is a beautiful and picturesque tiny town, big mill and water wheel. It reminds me of a small town in a novel or movie. The end of her yard is a woodsy area, so she gets raccoons, deer, possums and lots of feral cats which she shelters. They liked the house a lot and then he got laid off permanently. He looked for a job, got the one in NC and they thought of buying a home there as he liked his job, but then Carol’s mom, who used to live near me (I know Carol from high school) had a stroke and died immediately from it. Carol has a sister with special needs and she is her legal guardian. So her sister went to live with Carol and they wrapped up the estate. The sister is in her 50s, and was so distraught over their mother’s sudden death that she was seeing a therapist for a while, plus episodes of crying and believing she was somehow the cause of her death, that Carol thought it was better not to move her to still another house/environment, so they have stayed put. Tough story. Some people carry big loads. Yes, I feel from her from afar – she is very stressed out since Mary Beth has come to live with her – her mom died in 2012. plus Carol has the eye issues and high blood pressure. Mary Beth’s day program recently allowed members of a group home to come to the program by their own bus – the group home members began talking about their independence and Carol has tried to teach Mary Beth to do little chores at home – she balks at this as the mom never made her do anything. So Mary Beth announced she would like to go live in a group home so “I can do as I please” … Carol said she held her tongue, and I’m sure it was difficult to do, but the two sisters are both headstrong and battles do erupt from time to time. 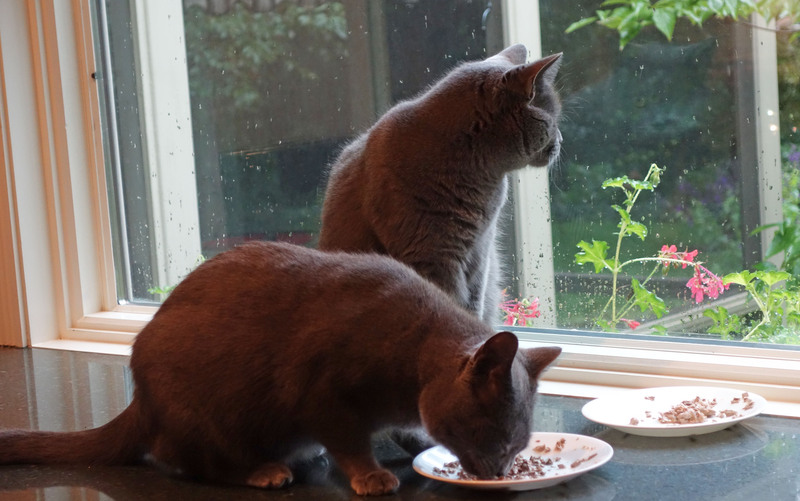 Carol has a heart of gold – what she does for these feral cats is incredible. She not only shelters them, but traps them, then pays for their feline distemper shots, a physical exam and a feral shelter fee to make them available to families. She takes it hard when one them must be euthanized for feline distemper – she brings them home and buries them at her house. She is a very good person. Yes she is – She posts everything on her mind all day on Facebook. I do see her losing patience though – she needs to get away from everything, even for a few days, with David, or just by herself. I know things feel strange around the house with someone missing and adjustments being made. Sending warm wishes. Thanks. We are doing well. It takes time. Figuring out the food has been the most challenging aspect and I’ve thrown some away because they weren’t interested or I gave too much. It is a new set of routines. That was interesting to read how the cats are adjusting. When we had three cats, they hated each other and never interacted with each other if they could help it. I didn’t notice any change in behavior when the first died. I’d guess the other two were thrilled. I once had a cat that was “hard to get along with.” She and Jake hated each other and eventually I had to separate them. 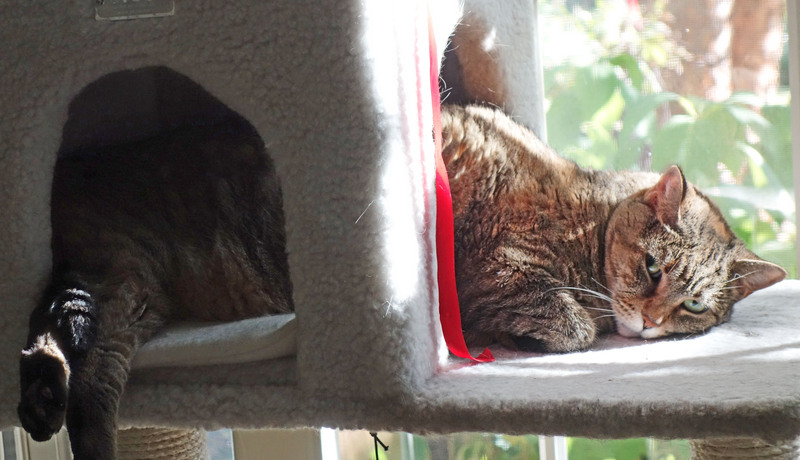 She was an older cat by then and content to stay upstairs and sleep on the bed in a guest room in a sunspot most of the day. I am so fortunate to have cats that get along these days. Life is so much easier. I think when Lacy died, Jake did a happy dance. I would like to have seen Jake’s happy dance. It was something. I swear he was smiling. I’m sure it will take some time. Sounds like they are off their feed for a bit. Lots of loving (in whatever form they accept) should help. I don’t know if they are eating less or if Hazel was finishing everything off. If I had to guess, it would be the latter. Cats are such interesting and mysterious creatures. I’m sure they notice Hazel’s absence but each has her own way of dealing with it. I continued to catch glimpses of my kitty for a few years after she was gone. They live in your heart. I still see Jake after 3 years. He was a black cat so it’s a dark shadow lurking under furniture and around corners. Sounds like things are ticking along Kate. Interesting about Hazel’s bed though……. It’s early yet. When Gracie had dental surgery two years ago she used the bed (Hazel had to make other arrangements) so you never know what to expect. I think I am detecting a return to your innate sense of humor re your cats’ personalities. You are all in this recovery process together. There has been a stray giggle or two floating around. I am always fascinated by cat reactions. Morgan did sniff everything. Mollie tried to put her scent on the cat tree but she didn’t stay to sleep in it. Maybe she called dibs? I used to worry so much about what my remaining cats were thinking when their roommate didn’t return. Sometimes I feel like it would be best if they could see and smell their companions after they have passed, so they know how to process it? I hate the communication barrier between us an our animal companions. In the wild an animal will leave and not return. Maybe because it was eaten or killed by a predator or because it was ill and they like to hide to die. Animals adjust better than we do. That is good info to digest. I’m so used to projecting my own emotional landscape on to them that it’s creates a mindtrap. We all do that and it gives us more grief. Bonded pairs, especially dogs, can be very affected by the death of their partner but my cats weren’t really bonded. They played together and were “friends” but they didn’t seek each other out. I am so sorry that Hazel is gone. I know how it hurts to say goodbye to a cat kid. Everyone finds their own way to grieve. Sounds like the clowder at your house is working on adjusting to the families loss. The new normal will take time to really be normal. Every day is different. Morgan got in the pantry and found a bag of cat treats. I have never used treats because of Hazel’s weight issues. There are teeth marks all over the bag so I started to give her a few at a time and hide it better. That’s exactly what they said! I am enjoying Morgan’s neediness. It’s nice to be wanted. I never over vacuum. Not to worry! I realized that Hazel is the 4th cat I have buried/lost in this house. The remaining ones don’t know any other house. Everything is a cat toy. Hi, Kate – I agree with cat (and Siberian Huskey) hair lasting forever. When I do find Cody’s hair under a cabinet, or in another remote place, I am still reluctant to throw it away. There is still a lot of it here I’m sure. I removed the mattress from the spare bed and cleaned her sleeping spot underneath. Oy vay! It was cleaned during the summer but it had a thick coating of gray hair. Your post was pretty funny. Sorry about your Michelin star! I lost two cats within 10 days of each other (unrelated geriatric illnesses) and never got to see how the survivor would adjust. Cat-watching is right up there with people watching. Or maybe better since they are cuter? They are cuter and nicer but people do weirder things! So sorry. Losing 2 so close would be very hard. Have you “seen” Hazel since she passed? We lost a cat last month, and recently I “saw” her move from the back of the sofa toward my lap when I sat down. Then of course I realized she WAS NOT there, and she disappeared. Then this morning, I made tuna salad for today’s lunch, put the fixings-bowl down for the dog, and the cat came running. I even said hello to her before I realized she WAS NOT there. Some kind of trick of the imagination due to missing her I’m sure . . . but sometimes I wonder. Yes, I see her lying on her favorite spots. I do a nose count before I got to bed to make sure no one got locked in a closet or on the porch and I always check for her too. Old habits take long to change. Your observations of the new dynamic are very interesting especially the part about the wet food consumption. Cats are so interesting. I suspect there will be more adjustments in the weeks ahead. All three are looking for more attention so that is new. It could also be that it’s winter so the porch is too cold to watch the wildlife outside. 🙂 That’s an old chair! Cat hair does live forever. I once found Hazel’s undercoat fur which was very thick in a mouse nest keeping everyone nice and warm. I have a chair from the 80s in my finished room in the basement. It was originally Magic’s (a favorite cat long gone) favorite. Many cats have used it because the basement is cool and quiet so they can sleep uninterrupted. Morgan claimed it for a long time but she hasn’t been there recently. The chair is in good condition except that the cat hair is entwined in the fabric. I could use it again if I recovered it. Glad everyone is doing okay. It may take time for new arrangements to get established. It will be interesting to see if anyone claims Hazel’s bed. The spot where Hazel’s bed is, was the same spot where I had Jake’s bed. His bed is at a new spot and no one has claimed it although occasionally I’ll see Gracie prancing around it. I had both beds next to the heat ducts so it’s prime real estate. We’ll see. I am trying to write in a not sad way just to share the changes. Some are very funny and some maybe a little sad. I often wonder what they think. They have excellent noses so they may have known she was sick.